Do you have one of those husbands or boyfriends who gets dates all jumbled in their heads? You know, there are just dates that women have a head for and guys seem to be, um, fuzzy about. These questions used to come up for me and Handsome Hubby a lot, so one year I made him a handmade Valentine’s gift. I made him a Relationship Timeline. A little personal information: Handsome Hubby calls me the Queen of Hearts. That’s even the name he used to log me into his phone’s contacts. I think he took it from that Eagles’ song Desperado. Don’t you draw the Queen of Diamonds, boy. 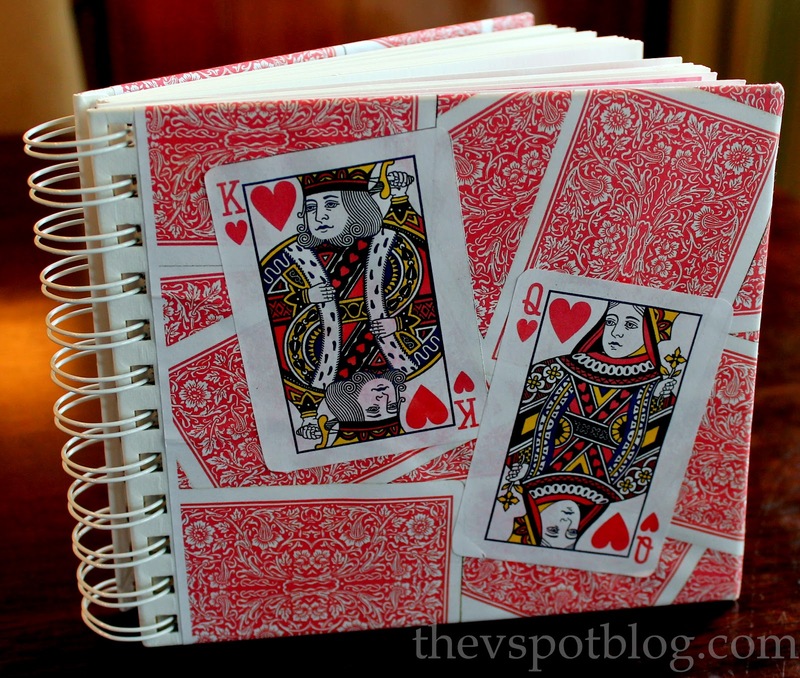 I took a deck of cards and made my own card printed paper on the color copier, then covered one of those little blank spiral bound scrapbooks with it. So I signed the book like a card and explained what it was. Since email replaced snail mail love letters, it was important to me to make sure they were preserved. This little handmade gift was quite easy to make. I did it 5 years ago, back when a Cricut was just noisy bug. I used an exacto knife, rub-on transfer letters and a glue stick. It’s very inexpensive and anyone can do it. Handsome Hubby really liked it and I had a good time making it for him. Both of us, on occasion, have taken the book and read through it. I love a good stroll down Memory Lane, and this Valentine’s gift can take us there any day of the year. That’s adorable!! What a lovely gift!! Truly, that is so sweet!!! 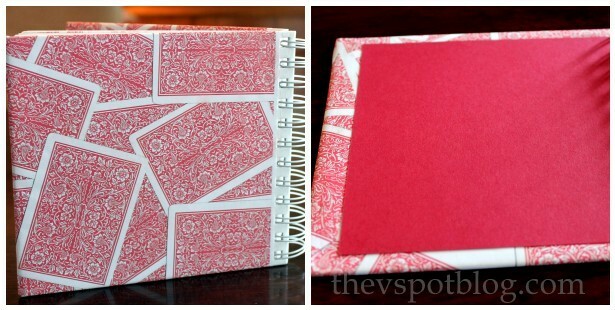 Great idea…I’ll definately do this when I have a Valentine!!! This is SUCH a GREAT idea!!! I totally love it. It makes me want to go back and look at old emails!! I think that is one of the sweetest gifts I have ever seen. I’m sure it is something that you both treasure, and how fun to look back on your relationship! Before marriage, before kids etc. This is really a keeper! I love that!! I tried to make a 10 “dates” book with a fun page for each date we were suppose to take – the letters fell off before I could even give it to him. FAIL. This is so cute. I am glad my husband does not read your blog and only reads mine or it would just give him further evidence into how very unsentimental I am sometimes. I would NEVER think to do this!!! I will just admire yours and know that my husband will be getting a store bought, but humorous card this Vday. So pathetic. I am a good wife in lots of other ways. I think. Love this Viv! What a wonderful and meaningful gift. My husband always struggles with dates of events in our lives…I even had our anniversary engraved inside of his wedding ring…lol A gift like this would be perfect for him! Thanks for sharing your idea! LOVE this! I so appreciate people who put effort into nurturing the things they love. ok, this is cracking me up. we can see which one of you is the ORGANIZED one, and the one that is good with REMEMBERING DATES! i am fuzzy on a lot of details, which can be SUPREMELY annoying when telling a story and sometimes shaky on the facts! i also tune out a lot when watching tv or movies, which leads to a lot of REWINDING when watching things! This is AMAZING!! What a heart-felt (pun intended) gift! I’m sure it’s something he’ll treasure forever. Going to skip over and re-read your love story…it’s such a good one. How incredibly special! What a wonderful idea! What a very cute idea! I should email M more. Now I just text him my sweet love nibbles.